You've heard the gimmicks and may have even considered them at some point in time. 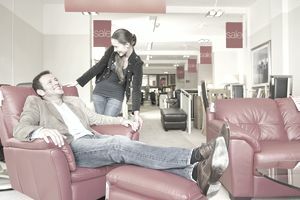 Furniture and electronic stores are known for advertising their in-store financing options that allow you to buy the goods at "90 days same as cash." You might also hear it advertised as "Buy now and make no payments until 2017!" It might sound like a good deal, but we all know that anything that seems too good to be true usually isn't. When the store promises "90 days same as cash," they're essentially promising you no interest payments for 90 days. In a perfect world, you'd be able to finance the purchase then pay off the balance in 90 days. You'd never pay a cent in interest. It'd be just like paying with cash. In the real world, it doesn't work like that. It seems like there's no reason not to take a 90 days same as cash deal. You get to walk away with your merchandise and a promise to pay back the money over the next few months. Without taking a close look at your income and expenses, you may even assume you can afford to pay off the balance within 90 days. Unfortunately, it doesn't always work out that way. More likely than not, you won't pay the balance within 90 days and you'll end up paying interest on the purchase. If you were able to pay off the purchase in 90 days, then you'd be able to save up and make the purchase in three months, avoiding the gimmick all together. You might rationalize that it's ok if you don't pay off the balance in 90 days. You'll just pay as much as you can and after that you'll deal with the interest. Here's the catch: The 90 days same as cash finances is a type of deferred interest financing arrangement that only works for your benefit if you pay off the balance in 90 days. If your balance isn't paid in full in 90 days, the interest is backdated to the date of the purchase then added onto your balance. So, you see, you only get 90 interest-free days if you pay the balance in full during that time. Otherwise, you haven't gotten the interest-free benefit at all. If you can't afford to pay for the purchase in full by the due date, you can't afford to finance it, not even on one of your low interest rate credit cards. The best option is to save up for large purchases so you don't have to worry about paying it back later. Even putting the purchase on a credit card is better than 90 days financing deal, especially if you qualify for a credit card with a 0% introductory rate on purchases. You'll have at least six months to pay off your balance and even if you don't interest starts after the promotional period ends. It's not backdated to the date of the purchase as it is with 90 days same as cash financing.